Lobster mushrooms are in season right now, and oh man alive, are they…alive! If you haven’t had lobster mushrooms, imagine a texture and flavor right from the sea. While it’s not exactly lobster, it does have some characteristics that are remarkable. The color, for one, is super accurate. Then, there’s just that hint of sea flavor that is undeniably cool. Cool because mushrooms don’t come from the sea, but somehow, all organisms are connected right? There’s a lot of ways to prepare lobster mushrooms, including the most common way of searing in butter and throwing in the oven to finish it off. I’ve done this before, and yielded great results. But, for this dish, I wanted to do something special with the lobster mushrooms. I wanted to steam them in a traditional Chinese style ginger and scallion bath, just to see what would happen. Guess what? It turned out fantastic! Steaming lobster mushrooms is so simple. What you’ll do to get started is thinly slice the garlic, ginger and green onions. We’ll set the onions aside for later. To prep the mushrooms, just rinse under cold water and wipe with a paper towel, being careful not to break the mushroom. We’ll cut them in half, or even smaller if you prefer. We’ll also be laying these over some bean thread noodles, and all you’ll need to do to prepare the bean thread noodles, is to soak them in water for about 10-15 minutes. Once the noodles get soft, we’ll plate everything down on a steam tray. I use a ceramic Chinese plate for this. We’ll add about 2 tbsp of water to the plate so that the noodles can absorb, cook, and most importantly, not stick to the plate upon steaming. Next, we’ll place the mushrooms down on top of the noodles and then evenly distribute the ginger and garlic slices. Set your plate onto a steam rack in a big pot and let it go for about 30 minutes. What you’ll see is the mushroom become translucent in the center, which will let you know when it’s tender. The colors will transfer onto the bean thread noodles which wasn’t expected, but totally cool! I poured on a light seafood soy sauce that is almost always used in Chinese dishes like this. Even though it says for seafood, there’s no actual seafood ingredients in this soy sauce. We’ll pour about 2 tbsp of soy sauce over our lobster mushrooms. For the finale, it’s imperative that you also pour over some hot cooking oil over everything. Heat up 3 tbsp of neutral cooking oil (I use avocado oil) and get it piping hot, just before it reaches its smoking point. We’ll top our lobster mushrooms with the fresh green onions and then finish everything with that hot oil to give the dish it’s final cook off. That hot oil should melt the green onions and really sear everything else, including the ginger and garlic, to mold all the flavors together. What you’ll end up with are tender pieces of lobster mushroom topped over bean thread noodles, which have absorbed that seafood soy sauce and hot oil flavor. All of the freshness from the ginger and green onions will hit your nose and offer that comforting Chinese style cuisine that we all love. Prepare all aromatics. Mince garlic and thinly slice a knob of ginger. Take three stalks of green onion and cut thin slices diagonally, to create onion strips. Set onions aside. Prepare a large pot with steam rack and add a 1/4 pot of water for boiling. Rinse lobster mushrooms under cold water. Pat dry with paper towel, being careful not to break any pieces off. Slice each lobster mushroom in half. In a medium bowl, soak 1 pack of bean thread noodles, in cold water, for 10 minutes or until noodles are soft. Strain noodles and place on a plate for steaming. 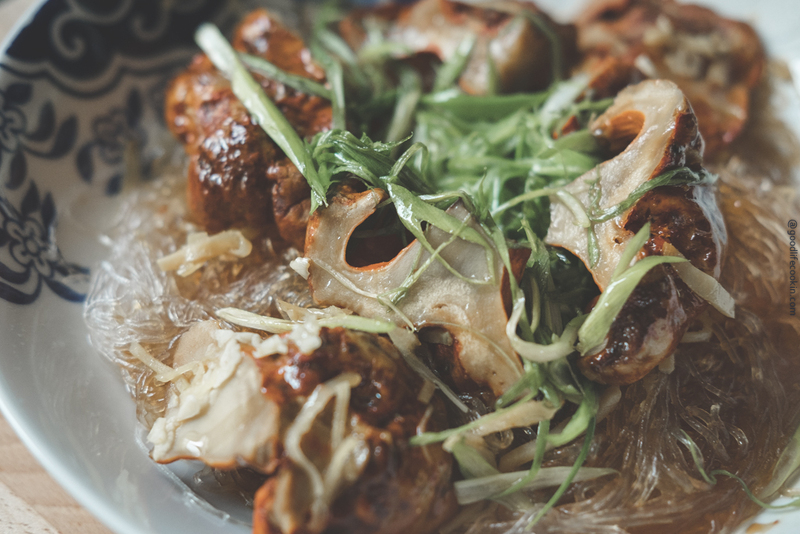 Lay mushrooms down over the bean thread noodles and add 2 tbsp of water. Evenly distribute garlic and ginger slices over the mushrooms with a pinch of salt. Place into steamer pot and cover on low heat for 30-35 minutes. Carefully remove plate from steamer. Pour 1.5 tbsp of Seafood Soy Sauce over mushroom and lay down thinly sliced green onion. In a small sauce pan, heat up 3 tbsp of cooking oil and when hot, pour over green onions and serve. Never heard of them. Must buy; must try!